Computer Teachers are involved in teaching the principles of the computer to students at different levels. Working mainly at elementary, middle school and high school level, the Computer Teacher performs duties such as – making lesson plan as per the age group, evaluating student performance, assigning special projects, communicating student progress to parents, providing an appropriate resource, conducting research and maintaining stocks of computer supplies. The other duties mentioned in Computer Teacher Resume include – developing and updating curriculum, designing and functioning of computers and research analysis; and providing teaching sessions in companies and at colleges. The required skills and qualifications needed for this role include – exceptional computer skills, strong communication skills, good knowledge of wide range of computer technologies, excellent troubleshooting skills, superior dexterity for keyboard and mouse operations and public speaking skills. A Master’s degree in the field of Computer Science along with a state Licensure is needed to pursue as Computer Teachers. 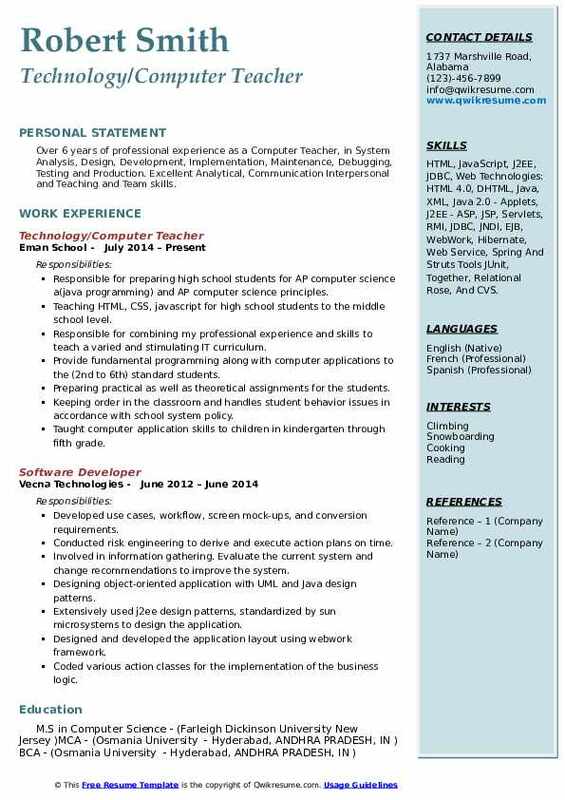 Objective : 4 years of experience as a Computer Teacher. Seeking to obtain a career opportunity in the customer service company where superb leadership skills and teamwork will create a productive and rewarding environment for both the clients and employees. Skills : Copy Editing, CSS, HTML, Java, Microsoft Office Suite, Spanish, Photoshop, Architecture, Autodesk Maya, And Adobe Creative Suite. Assists the teacher in planning and maintaining a safe, clean, learning environment and in. Follows the TCSD performance standards, all state policies and procedures and a written work plan. Maintains a positive, calm attitude and a soft voice, and encourage this attitude and voice. Assists teacher to implement the developmental assessment for each child. Assists the teacher in maintaining confidential child classroom folders. 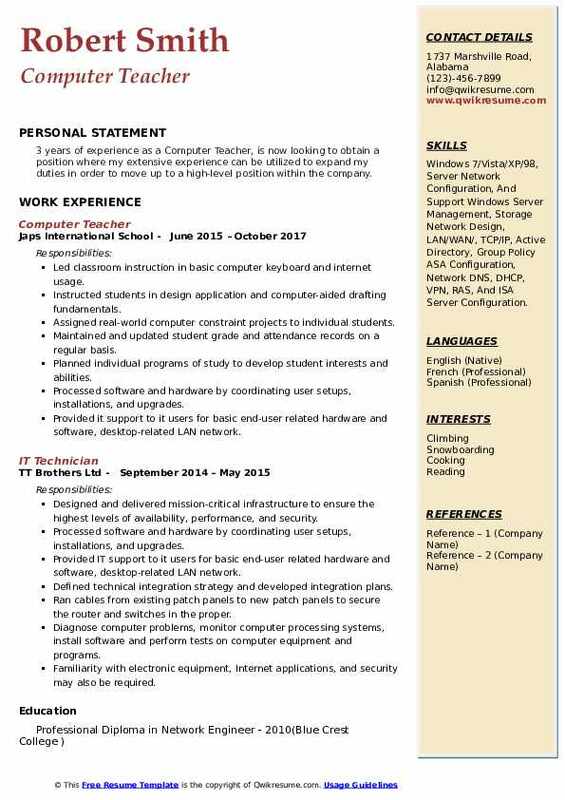 Headline : 6 years of experience as a Computer Teacher is now looking to obtain a position that will enable me to use my strong organizational skills, educational background, and maximize my networking and IT knowledge. Developed interesting course plans to meet the academic, intellectual and social base. Routinely met with students parents regarding in-class issues and learning. Observed students to supply teachers with feedback regarding their potential. Physically and verbally interacted with students throughout the day to keep them update. Supported students in developing strategies for individual needs and classroom. Evaluating student development, managing class and developing rules and discipline plans. 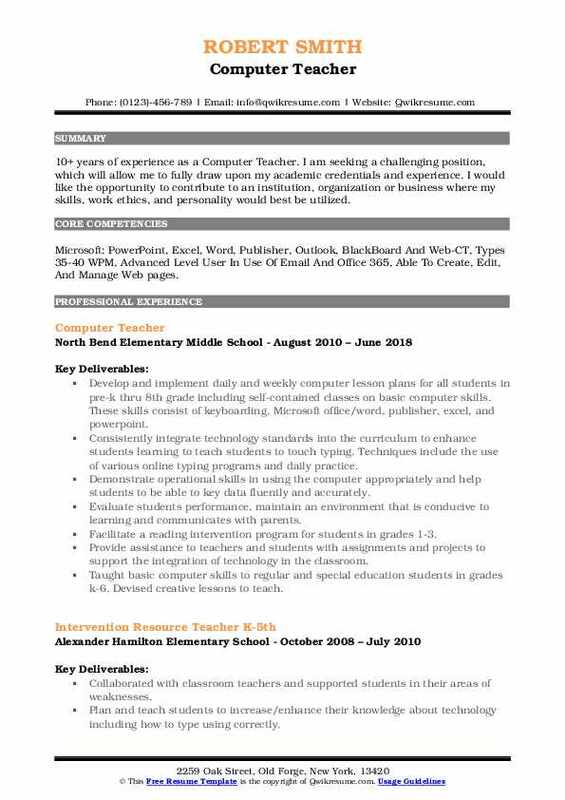 Headline : 6+ years of experience as a Computer Teacher is seeking a position of at your school to utilize my capabilities and professional experience for the academic progress of the students. Skills : Microsoft Office, Microsoft Word, Microsoft power point, Microsoft Excel, C++, HTML, PHP, Java, Photoshop, Photography, Autocad Architecture, Autodesk Maya, And Adobe Creative Suite. Ability to conduct classes of students from fifth grade to ninth grade in the computer. Excellent knowledge of the subjects and ability to effectively teach and communicate it to the students. Ability to conduct practical, giving the students' assignments, and evaluating them. Excellent oral communication skills, problem-solving, and decision-making abilities. Ability to plan and organize theoretical as well as practical computer classes for students. Reading science journals and collecting information about the recent developments in the field of computer programming. Interacting with students and guiding them to opt for the right courses and career in the future. Headline : 6 years of experience as a Computer Teacher. A highly skilled, talented and professional with diverse experience in conducting technical training for customers, field personnel, and internal staff. Seeking a full-time position utilizing my experience in a well-established organization where I can continue to advance professionally. 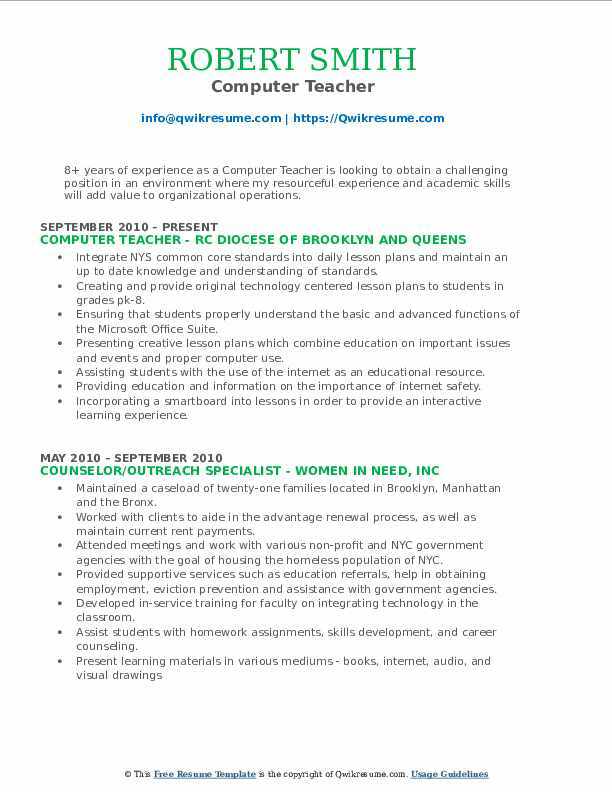 Skills : Copy Editing, CSS, HTML, Java, Microsoft Office Suite, Spanish, Photoshop, Budget Management, Apple Macintosh OSX, Microsoft Office, PhotoShop, Adobe Dreamweaver, Curriculum Development, Facebook, Wordpress, Twitter, Instagram, Vantive, Teaching, And Time Management. Responsible for planning activities and developing lesson plans for students and campers ages 3-15. Provide students with an instructor-led multi-media environment that focuses on basic mouse and keyboarding skills in a Mac-Based lab. Develop, coordinate and supervise all computer lab activities as well as assist staff in other departments with. Integrating technology into their classrooms. Design and implement the web-based curriculum. Manage and maintain all systems, equipment, computers, and iPads and troubleshoot hardware and software issues that occur within the lab. Provide technical. Assistance for staff members as needed. Assist both camp and school with social networking via facebook, twitter and Wordpress blogs. Write and post articles to camp and school Wordpress blogs on a regular basis. Develop videos and slideshows for the camp and school using iMovie and Animoto. Post videos to the computer lab youtube channel. Act as facebook administrator on behalf of the school and day camp and post relative content on a regular basis. Monitor Facebook activity and continuously work to promote the camp and school. Active photographer for both camp and school. Maintain and manage the camp and school Shutterfly photo accounts. Headline : Over 6 years of professional experience as a Computer Teacher, in System Analysis, Design, Development, Implementation, Maintenance, Debugging, Testing and Production. Excellent Analytical, Communication Interpersonal and Teaching and Team skills. Responsible for preparing high school students for AP computer science a(java programming) and AP computer science principles. Responsible for combining my professional experience and skills to teach a varied and stimulating IT curriculum. Provide fundamental programming along with computer applications to the (2nd to 6th) standard students. Preparing practical as well as theoretical assignments for the students. Keeping order in the classroom and handles student behavior issues in accordance with school system policy. Taught computer application skills to children in kindergarten through fifth grade. Supported classroom teachers when integrating technology into curriculum. Summary : An inspiring Computer Science teacher with 19+ years of experience, who believes that high expectations within the school lead to high levels of achievement. 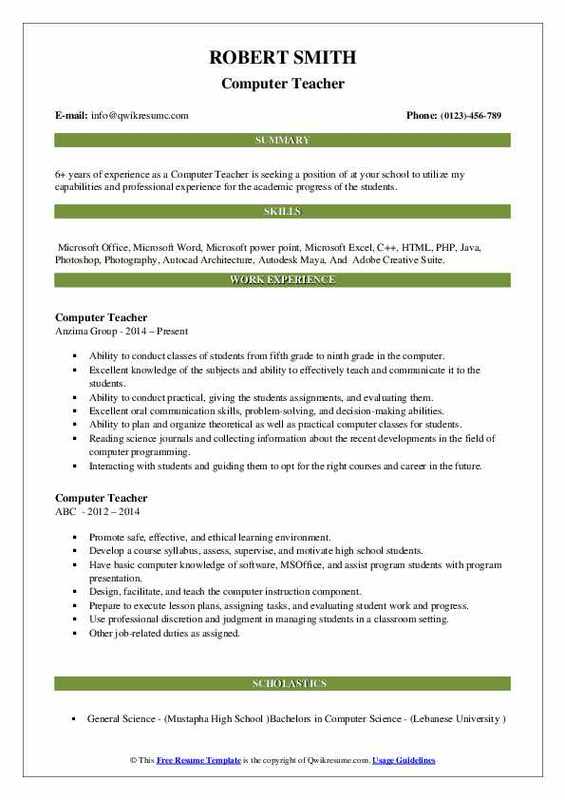 Skills : Teaching, Typing, Web Design, Writing, Microsoft Office 2016, Google Docs, Google Sheets, Google Forms, C++, RobotC, Microsoft Server 2008 AD And Network. Manage the daily running of the computer lab, Create the computer labs daily. Schedule, create and instruct high school computer skills class, create and instruct elementary school. Computer science classes, assist teachers to integrate computers into their curriculum, select educational software for the computer lab, perform monthly maintenance on all computers, troubleshoot the computer. Managing the 4-6 grade self-contained special education class daily activities. Creating the self-contained classrooms schedule, wrote and monitored students iEP goals, coordinated special education, and classroom work, and supported classroom teachers to meet the needs of the Special education students in the regular classroom. Assisted my co-special education teachers with computer/printer problems. Identifies varying teaching methods that work best for students who learn. 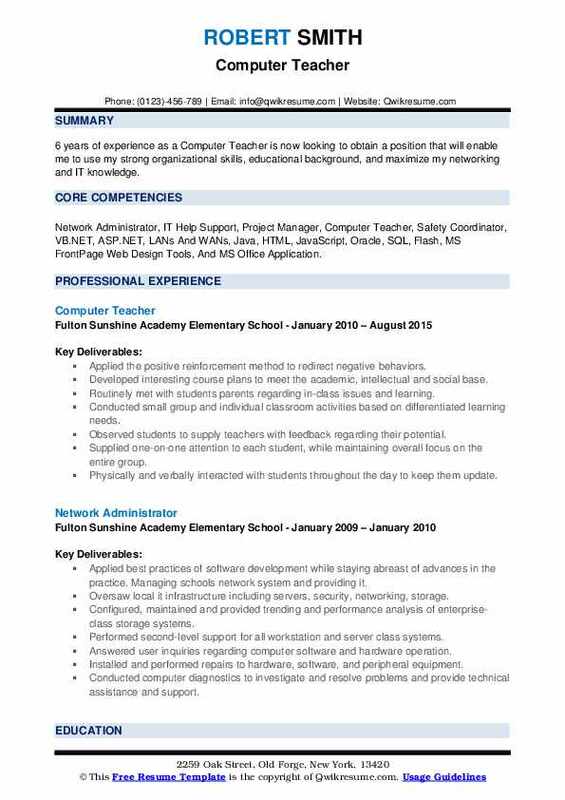 Summary : 8+ years of experience as a Computer Teacher is looking to obtain a challenging position in an environment where my resourceful experience and academic skills will add value to organizational operations. Skills : Microsoft Office 2016, Google Docs, Google Sheets, Google Forms, C++, RobotC, Microsoft Server 2008 AD, Network, And Support Of Google Chromebooks. Integrate NYS common core standards into daily lesson plans and maintain an up to date knowledge and understanding of standards. Creating and provide original technology centered lesson plans to students in grades pk-8. Ensuring that students properly understand the basic and advanced functions of the Microsoft Office Suite. Presenting creative lesson plans which combine education on important issues and events and proper computer use. Assisting students with the use of the internet as an educational resource. Providing education and information on the importance of internet safety. Incorporating a smartboard into lessons in order to provide an interactive learning experience. 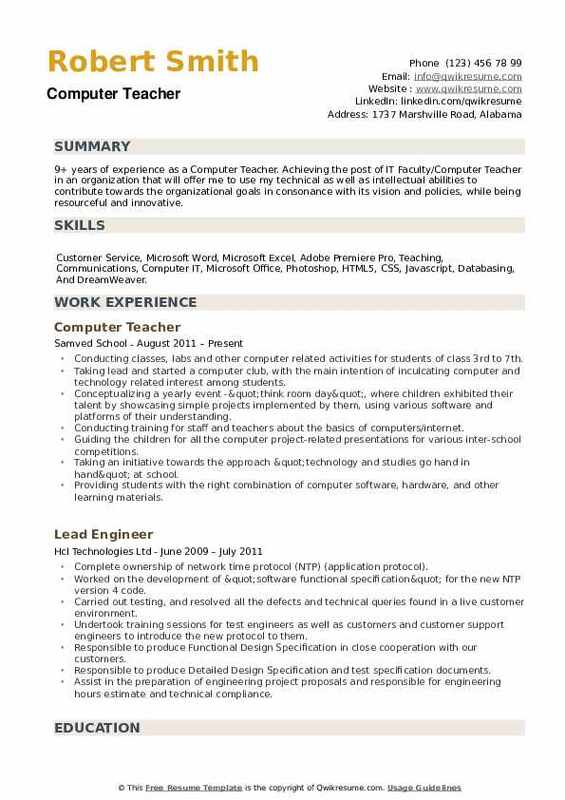 Summary : 10+ years of experience as a Computer Teacher. I am seeking a challenging position, which will allow me to fully draw upon my academic credentials and experience. I would like the opportunity to contribute to an institution, organization or business where my skills, work ethics, and personality would best be utilized. Skills : Microsoft: PowerPoint, Excel, Word, Publisher, Outlook, BlackBoard And Web-CT, Types 35-40 WPM, Advanced Level User In Use Of Email And Office 365, Able To Create, Edit, And Manage Web pages. Develop and implement daily and weekly computer lesson plans for all students in pre-k thru 8th grade including self-contained classes on basic computer skills. 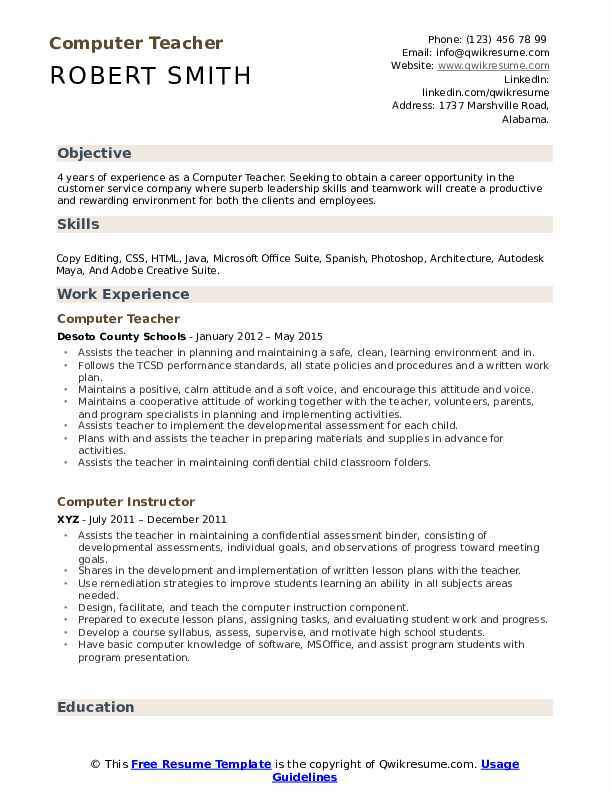 These skills consist of keyboarding, Microsoft office/word, publisher, excel, and powerpoint. Consistently integrate technology standards into the curriculum to enhance students learning to teach students to touch typing. Techniques include the use of various online typing programs and daily practice. Demonstrate operational skills in using the computer appropriately and help students to be able to key data fluently and accurately. Evaluate students performance, maintain an environment that is conducive to learning and communicates with parents. Facilitate a reading intervention program for students in grades 1-3. Provide assistance to teachers and students with assignments and projects to support the integration of technology in the classroom. Taught basic computer skills to regular and special education students in grades k-6. Devised creative lessons to teach. 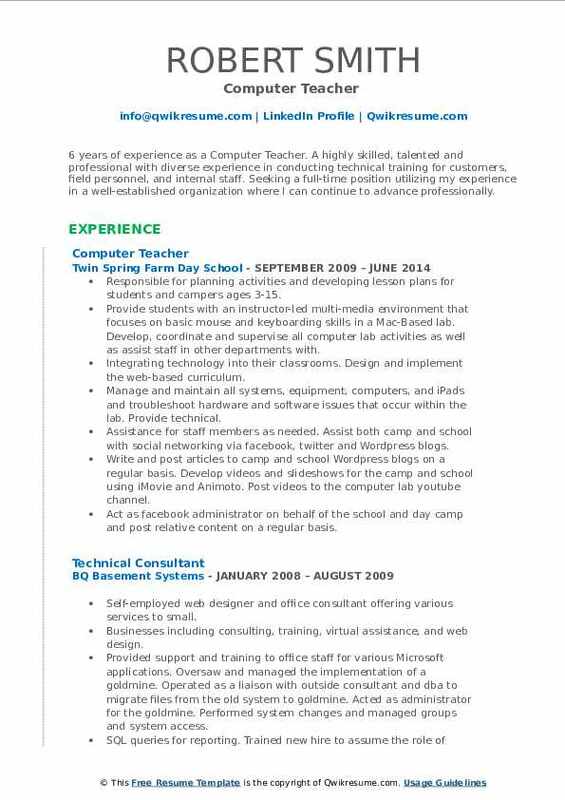 Objective : 3 years of experience as a Computer Teacher, is now looking to obtain a position where my extensive experience can be utilized to expand my duties in order to move up to a high-level position within the company. Skills : Windows 7/Vista/XP/98, Server Network Configuration, And Support Windows Server Management, Storage Network Design, LAN/WAN/, TCP/IP, Active Directory, Group Policy ASA Configuration, Network DNS, DHCP, VPN, RAS, And ISA Server Configuration. Led classroom instruction in basic computer keyboard and internet usage. Instructed students in design application and computer-aided drafting fundamentals. Assigned real-world computer constraint projects to individual students. Maintained and updated student grade and attendance records on a regular basis. Planned individual programs of study to develop student interests and abilities. Processed software and hardware by coordinating user setups, installations, and upgrades. Provided it support to it users for basic end-user related hardware and software, desktop-related LAN network. Prepared students for parcc testing by teaching correct hand placement for typing and basic computer skills. 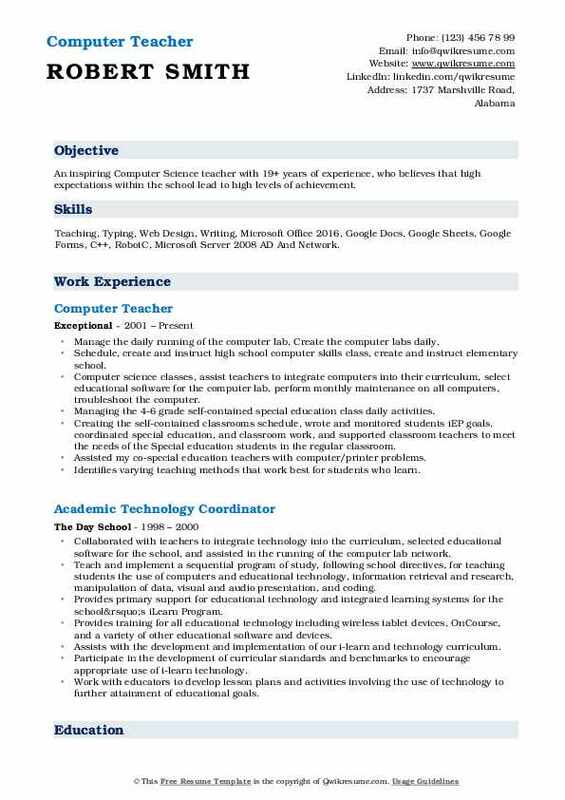 Summary : 9+ years of experience as a Computer Teacher. Achieving the post of IT Faculty/Computer Teacher in an organization that will offer me to use my technical as well as intellectual abilities to contribute towards the organizational goals in consonance with its vision and policies, while being resourceful and innovative. Conducting classes, labs and other computer related activities for students of class 3rd to 7th. Taking lead and started a computer club, with the main intention of inculcating computer and technology related interest among students. Conceptualizing a yearly event -"think room day", where children exhibited their talent by showcasing simple projects implemented by them, using various software and platforms of their understanding. Conducting training for staff and teachers about the basics of computers/internet. Guiding the children for all the computer project-related presentations for various inter-school competitions. Taking an initiative towards the approach "technology and studies go hand in hand" at school. Providing students with the right combination of computer software, hardware, and other learning materials.